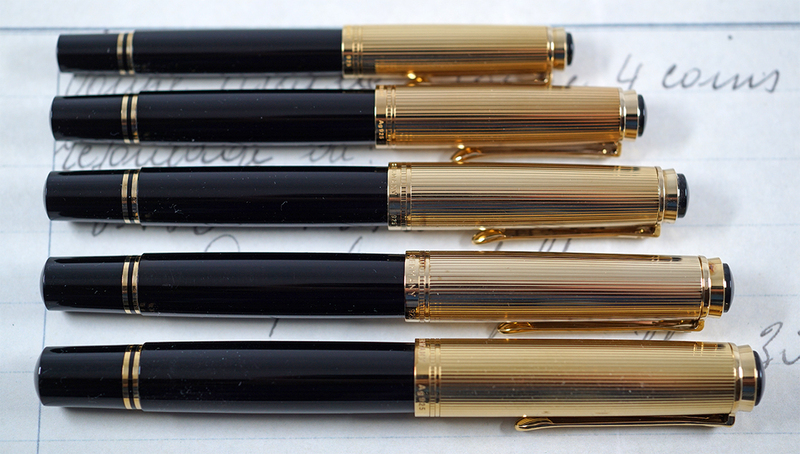 These vermeil beauties are really only distinguished by their metal cap and 18 carat nibs. They all sport the same guilloche pattern on the cap with a blank plate on the side to facilitate a personalized engraving should one desire. 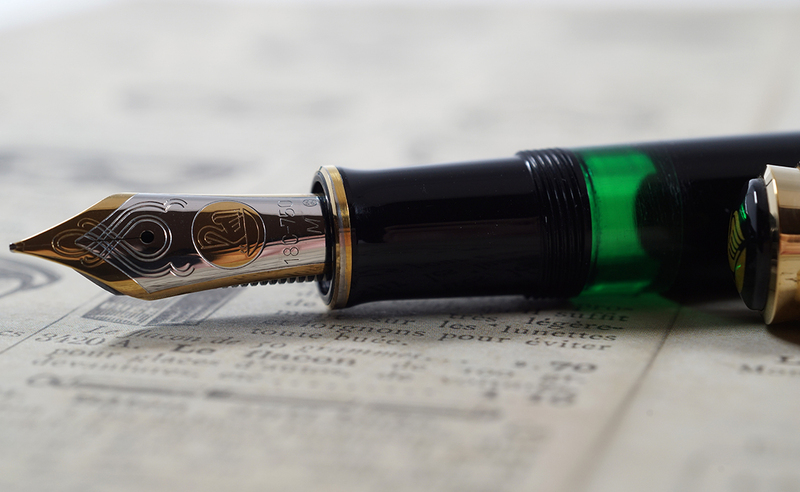 The cap lip has a band around its circumference and the area above the lip is engraved “Pelikan Souverän Germany Ag925,” a stamp that denotes the underlying sterling silver. All of the cap tops, except for the M450 Tortoise, will display the older, painted two chick company logo. The nibs are all 18C-750 gold, even on the smaller Souveräns for which that isn’t the usual standard. There isn’t much more to say about the series as a whole but it is worth highlighting a few anecdotes. In general, production ran from 1997/98 until 2001. The M450 Light Green Tortoise is the notable stand out. It is an outlier of sorts because it came out several years later than the other models, was the only pen done in a tortoise finish, and included a vermeil piston knob. 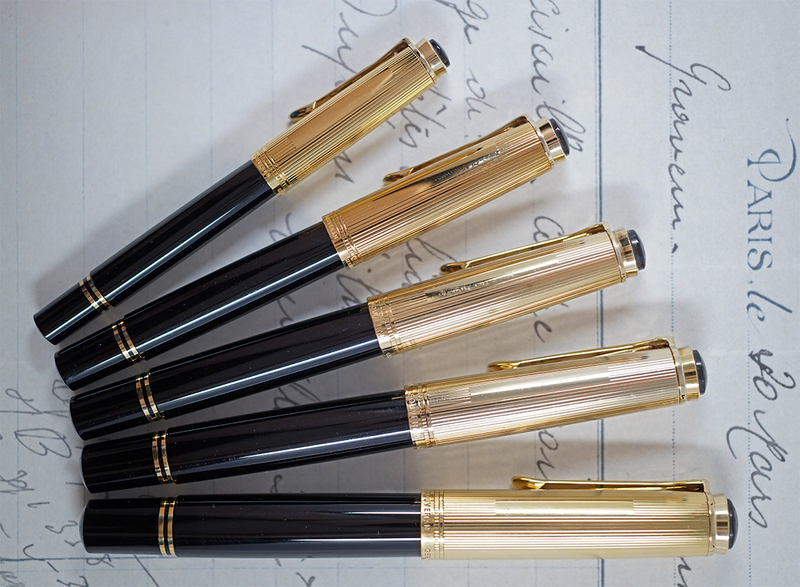 Many of the fountain pens were available with a companion ballpoint, rollerball, and/or pencil. Interestingly, the black K450 and K650 ballpoints were the same size/design. The same holds true for the black D450 and D650 pencils. Perhaps the only other thing worth pointing out is the large selection of available nib widths that would have accompanied these. Unlike today’s offerings, Pelikan’s line of factory nibs contained a lot more variety than what we see today. You can see the different models highlighted in the table below. *The black K450/650 ballpoints and D450/650 pencils were the same writing instrument with different designations. One last thing worth mentioning is just how to properly care for a piece of vermeil. It is recommended to avoid exposure to cleaners and harsh chemicals which can damage the finish. Buffing the cap gently with a microfiber cloth is all that is usually necessary. Doing otherwise might result in stripping off the gold finish. When not using your pen, storing it in an airtight container can help prevent oxidation though that is not a necessity. The outer gold layer will also protect against this but, over time, the gold layer is likely to tarnish. A jeweler’s polishing cloth or some mild soap and water are usually all that’s needed to remedy the tarnish though you are free to leave it as it can add a unique sense of character to the pen. It would be time for a revival. A full Vermeil would be even MUCH better. 2001 they stopped the production, so 2021 would be a good timing. An interesting suggestion. That would probably make for a heavy pen but I could get behind that. Not sure how affordable it would be though. Very cool. Haven’t run across these. 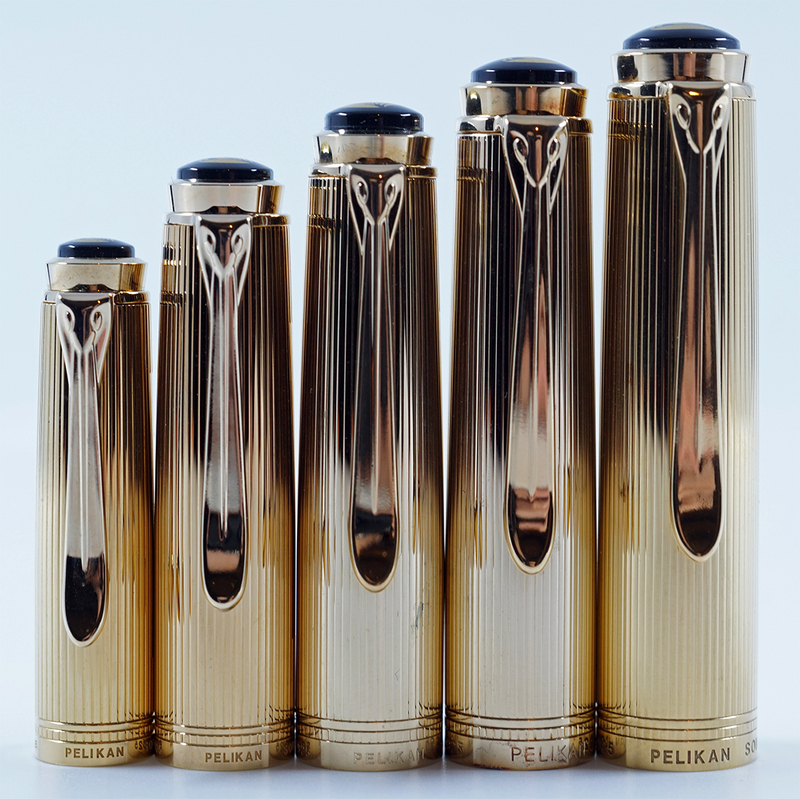 Very attractive looking Pelikans. If they released these today, what do you think they’d cost? In 2000, the M850 had an MSRP of 1000 DM and the M1050 was listed at 1300 DM. Of course the Deutsche Mark is now obsolete. I’d say we’d be looking at substantially more than that today. I’d expect retail to be closer to $1500 if released today. 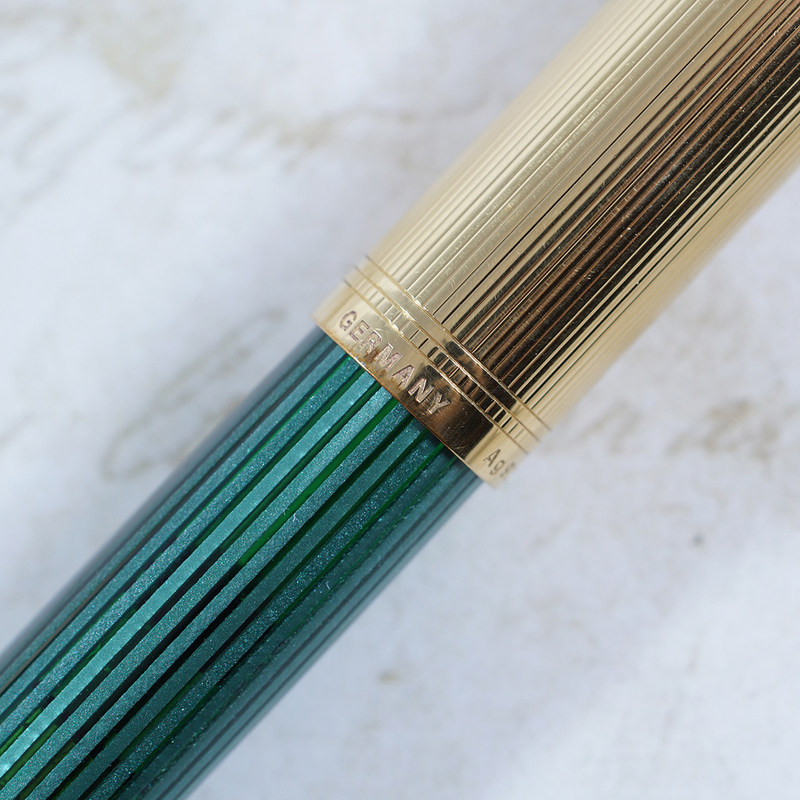 How much would an M850 vermeil Pelikan fountain pen cost in Indian rupees (INR)? A most complete discussion on the Vermiel cap Pelikans and other offsprings. Thanks for your excellent write & great photography. Joshua. Great article. Is the silver cap with black body – a size like an M400 also a vermeil? I’m not quite sure that I understand your question. 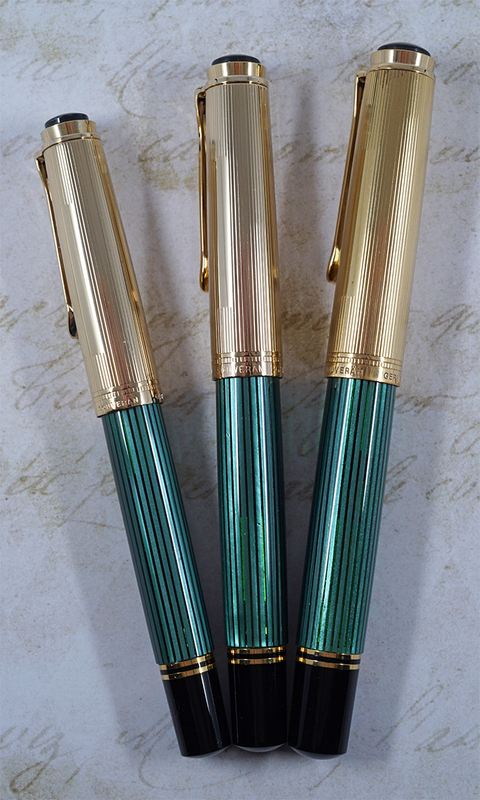 Pelikan has made a few M4xx pens with silver caps. The M450 is the only one that was done in Vermeil that I can recall off the top of my head. Great article. I have a question, I have a blue M850, is this possible? or is the cap a mismatch? Hello Chris. Thanks for reading. It does indeed sound like a mismatch since the M850 came in only Black and Green Striped. I have seen people take the vermeil caps and put them on blue and red striped versions but they were not released from the factory that way. It’s a little bit of a frankenpen but nothing I’d be upset to own.